To enable high throughputs, the WFMD process makes use of radiation heating elements that are scalable. Output capacity is only limited by the heater capacity and the volume of the material heated at any one time. The system makes use of commercial grade MIG wire feedstock and heats it to produce a stream of molten metal. Manipulation of the melt head using a high speed CNC system allows the generation of 3D metal components. The use of wire as opposed to the more standard powder technologies provides many advantages, such as reduced materials cost, simple handling and a safe working environment. 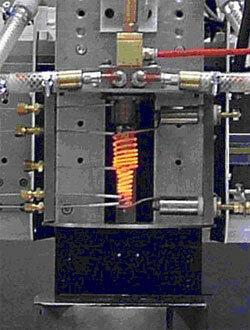 The core of the WFMD system is the melt chamber into which metal wire is fed and liquefied by radiant heaters. The precise extrusion of metal is obtained by varying the pressure in the melt chamber using feedback control. The system is manipulated by a 3 axis CNC machine allowing laminar part construction. The WFMD process, because of its relatively low cost and versatile material capability, can significantly broaden the user base for the Rapid Manufacturing of metals, much as 3D printing expanded the Rapid Manufacturing of plastics.